For a long time, I couldn’t get myself to write a review of this book because I thought Michael Geary’s The Truth About Six Pack Abs was just another scam – a weight loss book that sucked people’s money for nothing. Until I really picked up the book and read it after I changed to healthy eating and subsequently lost 10 kg in 2 months. I experienced my weight loss BEFORE I read this book. But why do I talk about this book if I can get a slimmer body without the book? Coincidentally, I did exactly what the book says to get a healthy, slimmer body. What outlines in Truth About Abs is aligned with what I experienced and the results I get. Only after I experienced weight loss did I start to appreciate this book more. Let’s take a close look at this health and fitness book. From my experience, diet is more important than exercise when it comes to healthy body and weight loss. This is also what the book says. It has several chapters on diet alone. Diet is a section that comes before everything else such as exercises. That shows how important it is to get the right diet first before you do anything else. Once you get this on the right track, the rest is easy. To lose weight, you won’t go wrong with this principle: feed yourself with natural, unprocessed and unrefined foods. Nevertheless, with no disrespect, there’s one area that I disagree with Mike – when he talks about soy bean is a food that you need to avoid. I guess soy beans still play an important role in nutrition – provided you get from the right source. Another area I am not sure if I should agree with Mike is saturated fats. I know it is a controversial topic. I have to do more reading to find out if what Mike claims is true. He says that saturated fats are good for us as long as we get it from grass-fed, free-range animals. Another plus for the book: it contains 12 + 72 meal ideas that promote balanced diet. You won’t find low carb or low sugar diets here because Mike promotes that you have to take in all three macronutrients: proteins, carbohydrates, and fats (the healthy ones). While this book’s focus is on developing six-pack abs, the author does not forget to tell you that doing exercise is not the ONLY thing. I know I already said that but I need to say it again: Getting a healthy, balanced diet is far more important than exercise. Also, while exercise is important, it is not about doing crunches – as what most people get it wrong here. Mike argues that doing abdominal exercises is not the most effective way to get beautiful abs. In contrast, full body training is the answer. There is a list of bad exercises to avoid in the book. They are either ineffective or dangerous to perform. On the other hand, Mike provides a list of exercises you should do for your abs. All exercises are shown step-by-step using colored pictures. They are categorized by levels – from Level 1 to Level 8. A discussion on free weights versus machines is also included. Don’t worry, if you don’t have the budget, you don’t need to buy any equipment. You can use your bodyweight for exercise. Whatever it is, you can still achieve permanent weight loss and six-pack abs. Mike does his best to help you save. However, if you choose to buy anything, there are only two equipment you need to buy. The book ends with a section on FAQs that addresses any questions you have with regards to six pack abs. For example: To lose fat, why is it not necessary to do 1-2 hours of cardio each day. And more. Overall, I give Truth About Abs a thumbs up. It is easy to read (not too technical for laymen) and highly executable. As a certified personal trainer and certified nutrition specialist, Mike knows what he is talking about and he knows his stuff well. The section on diet has proven to be effective in losing weight – as I have experienced myself. I believe what Mike suggests here is timeless and it works. While I have not followed the exercises in the book, I believe if you follow some but not all of the workouts here, you will have a nicely toned abs in a very short time. 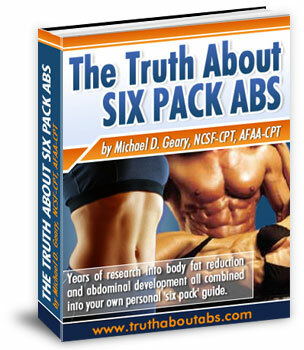 Truth About Abs is in ebook format which means you can download immediately after ordering. The book is written for both men and women. For more info, visit Truth About Abs.